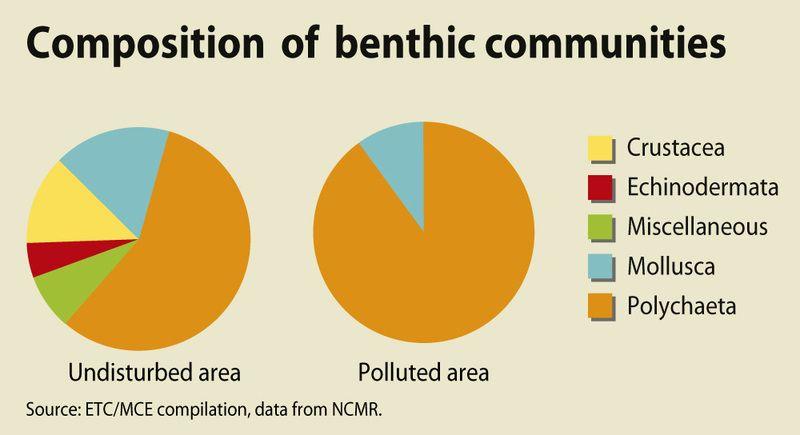 Benthic communities are among the first to disappear under conditions of heavy stress. Benthic organisms play an important ecological role by reworking the sediments, which affects the flux of nutrients across the sediment-water interface. Thus their loss is a liability to the ecosystem as a whole. In undisturbed areas in the eastern Mediterranean, benthic communities have a high diversity of species, consisting of polychaetes (50–65%),molluscs (15–25 %), crustaceans (10–20 %), echinoderms (5–8 %) and miscellaneous taxa. By contrast, in areas ranging from heavily disturbed (e.g., sewage outfall vicinity) to polluted (e.g., urbanised bay), echinoderms, crustaceans and miscellaneous taxa largely disappear, while a small number of polychaete species account for 70–90 % of the total abundance (Stergiou et al. 1997). The same applies to the Western Mediterranean benthic communities, where increasing disturbance also leads to reduction in species richness.